What better way to enjoy night-time London? No crowds, great views and a four-course dinner aboard the London Showboat with entertainment and dancing plus an overnight London hotel stay. What better way to enjoy night-time London. No crowds, great views and a delicious four course dinner which starts as soon you slip the moorings. Sail through the very heart of the capital and enjoy the gorgeous sights and sounds of the vibrant city at night. It doesn’t get any better. Good food, great entertainment, fabulous views then back to your hotel for a good nights sleep. 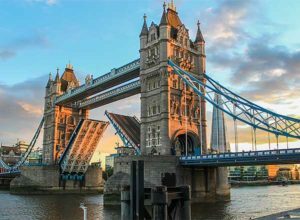 This London city cruise package deal includes an overnight stay at your choice of hotel and additional nights can be added if you wish to create a longer break. Once you have chosen your London dinner cruise date and ticket type you will be able to choose your accommodation from the list of hotels that have availability for your travel dates. Lead in price of £110 per person was for a River Thames dinner cruise on 9 June 2019 and overnight stay at the EasyHotel South Kensington (TripAdvisor Rating 3) based on 2 adults sharing. Prices are shown for guidance only and were available at the last update. Actual price will vary depending on travel dates, time of booking, hotel and duration of your break.